No need to wait for an occasion to serve this festive chicken salad. A good time will be had as soon as the zingy feta and sweet fruit come together. Toss bread cubes with 1/4 cup dressing; spread in single layer on ungreased baking sheet. Bake 6 to 10 min. or until golden brown; cool. 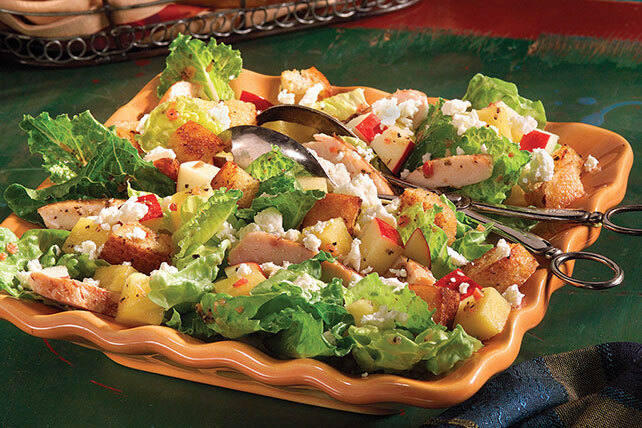 Toss greens with chicken, pineapple, apples and remaining dressing in large bowl. Add bread cubes; mix lightly. Sprinkle with cheese. When preparing salads, use apple varieties that are best when eaten raw. Golden Delicious, Red Delicious and Gala apples are good choices.